Some of you may have already seen some of these, but I just had the chance to look at them this week, and was so impressed I wanted pass them along. Hocus Pocus It's Fall! by Anne Sibly O'Brien and Susan Gal. August 16, 2016. Harry N. Abrams. 24 pages. Ages 3-5. Just in time for Fall! 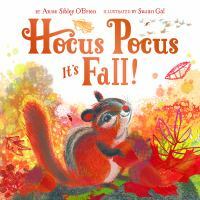 This book reminds me of Tap The Magic Tree, with the way it portrays all the changes of the season as if by magic and can be highly interactive. Have the audience say the magic words on each page, then open up the page to reveal the transformation. The illustrations are full of rich autumn colors, and have a slightly nostalgic feel. I was just remembering that I needed something to jazz up my Fall line-up, and this is perfect! I can't wait to use this in my Fall storytimes! Everyone Loves Cupcake by Kelly DiPucchio, illustrated by Eric Wight. September 6, 2016. Farrar, Straus and Giroux. 40 pages. Ages 3-6. If you loved last years' Everyone Loves Bacon, you'll love this next installment. Cupcake is sweet, beautiful, and has a tiara! No wonder everyone loves her (Coffee loves her "a latte" and Brownie is "nuts about her"). But then Cupcake begins to worry about living up to her image of perfection and starts trying too hard, annoying her friends. In the end, she learns to be comfortable with herself and be who she is. I loved this book, with all its little jokes and puns, and the Cupcake character (not surprising considering I used to have a cake business and recently gave a cupcake decorating demo). Right after my co-worker showed it to me, I ordered one for my personal collection! The humor might be a little too sophisticated for preschoolers, but kindergartners through third graders will love it. Is That Wise, Pig? by Jan Thomas. September 13, 2016. Beach Lane Books. 40 pages. Ages 3-8. 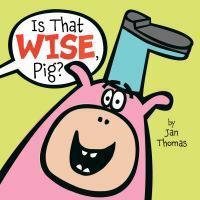 Jan Thomas' books are always full of good, silly fun, and her latest one does not disappoint. But this one has the added bonus of counting. Pig and Cow are helping mouse make some delicious soup. Mouse adds one onion, Cow adds two cabbages, and Pig starts to add three...umbrellas!? "Is that wise, Pig?" They continue, with Pig bringing the most unlikely contributions each time, culminating in a chaotic ending and last-minute change in dinner plans. I love Jan Thomas' books with their simple, silly humor and bright, bold simple illustrations, and most of them have been big storytime hits, as I predict this one will be. Thank you!! I just put them all on hold!! Love your blog!! Thanks for stopping by, and I'm glad you find it helpful! I love getting feedback. I just wish I had more time to review new books and put booklists together in addition to writing up my storytimes, but I'm spread a little thin right now. These all sound lovely. We loved Tap the Magic tree we also have to look for this new one to add to the fall collection and the cupcake one sounds like one my daughter would enjoy. Great suggestions. I recently discovered the same authors also wrote one for spring, "Abracadabra, It's Spring!" that I somehow missed when it came out earlier this year. I used "Hocus Pocus, It's Fall!" this week, and the kids seemed to enjoy saying all the magic words.